Have a party at Celebration Hill! Have the Zoo do all the work! Our birthday party package is perfect for kids of all ages. 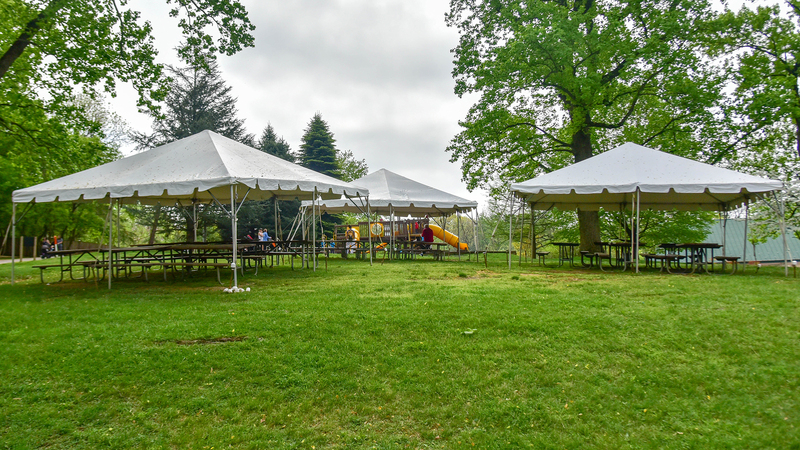 Party packages at Celebration Hill are available Saturdays and Sundays only, April 14, 2018, through October 14, 2018, at 10:30am and 12:30pm. Is your party taking place October through April? Take a look at our indoor, winter party packages or visit our self-run party page for year-round fun. Check availability of your preferred date! Availability of date is not guaranteed until confirmed by Group Sales office. Reservations must be received a minimum of one month in advance of the requested date. The Zoo opens for the day at 10AM and closes PROMPTLY at 4PM. Wristbands are all day admission; please keep this in mind when planning your day at the Zoo. There is picnic-style seating for 30-40 guests under your party’s tent. Full package payment must be received with the form to reserve date and time. Cancellations made up to two weeks prior to party date will receive a 75% refund. No refunds for parties canceling within two weeks of party date; however, you may reschedule based on availability. One chaperone of at least 21 years of age is required per every 8 children. Parties are held rain or shine under tents. Rain dates are available if weather severe. To reschedule, please leave a message at (443)552-5277 or email groupsales@marylandzoo.org no later than 12PM on the Friday before the scheduled event. If sufficient notice is not received, the Zoo will assume that the party will take place. Maryland Zoo members or guests under 2 years old receive free admission but will need to purchase wristbands for the rides. You can continue to add and pay for additional guests, pizzas, wristbands or cake up to 10 days prior to the party. Admission passes are mailed after receipt of final numbers and payment. You may distribute wristbands to your guests in advance, or you may also pick up your wristbands at the Main Gate on the party date to distribute to your guests as they arrive. Individual “will call” CANNOT be accommodated. There are no refunds for unused wristbands. Availability of train and carousel are weather-permitting. You may bring your own additional food and beverages to supplement the package. Balloons, straws, alcohol glass containers, and confetti are PROHIBITED on Zoo grounds. To contact the Group Sales Office, please email groupsales@marylandzoo.org or call 443.552.5277.